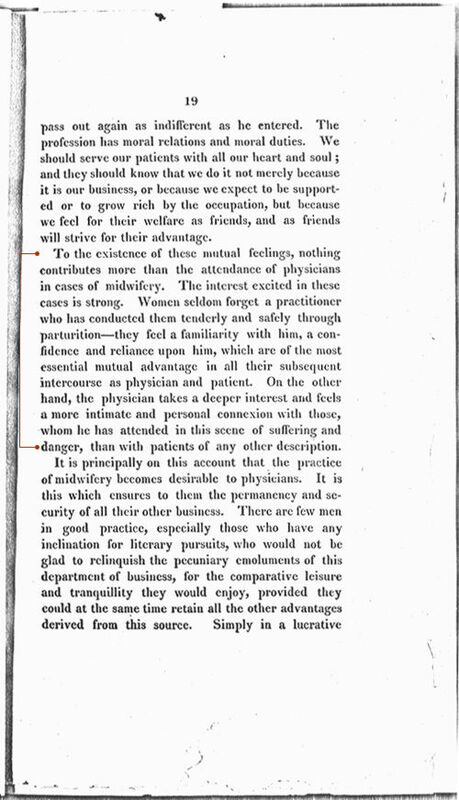 The author of this article, variously attributed to William Channing or John Ware, was a U.S. physician who published his remarks anonymously. As one of the nineteenth century's newly-professionalized male doctors, the author argues that males, not females, should assist births. 1. What advantages did the author see for a doctor who practices midwifery? 2. According to the author, what role did money play in the inclination of doctors to attend women during pregnancy and birth? 1. What were the author's arguments against women in midwifery? 2. How could the author's occupation have affected his arguments?